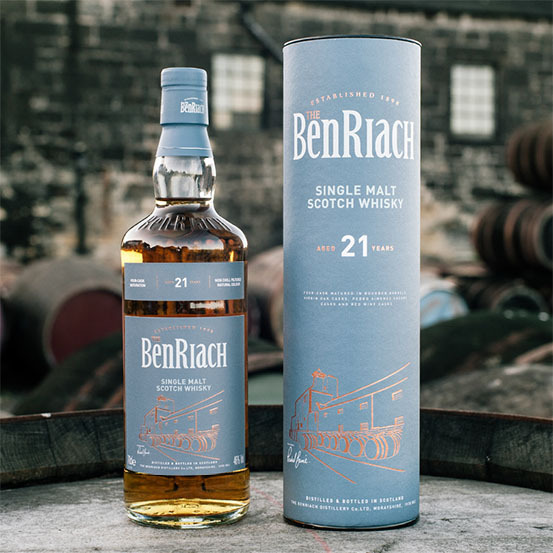 BenRiach Distillery announces the release of a twenty-one year old Speyside Single Malt Scotch Whisky, unconventionally matured in a combination of four types of cask: bourbon barrels, virgin oak, Pedro Ximenez and red wine casks. These four cask types are expertly blended together by the BenRiach Master Blender, Rachel Barrie, to create a multi-faceted and superbly balanced malt. Each cask amplifies unique notes of bourbon vanilla, virgin oak spice, PX sweetness and vinous red fruits developing from BenRiach’s signature sweet barley and fruit-laden style. This unpeated single malt is one of two BenRiach expressions to be released at 21 years old, and the other, its richly peated partner, will appear early 2018. The quality of these whiskies has already been recognised at the 2017 International Wine & Spirits Competition (IWSC) where both 21 year old expressions won Silver Outstanding medals.